The town of Falmouth is part of the Portland-South Portland-Biddeford Metro area in Cumberland County. This suburban town has Casco Bay as its border and has one of the largest anchorages in all of Maine. There are three private golf clubs as well as the renowned Portland yacht club within its vicinity. Falmouth is considered one of the more affluent suburbs of Portland. There are 11,185 residents in 4334 households, according to the latest population estimates. The town encompasses 36.34 square miles of land and water. On average, homes in town are fairly large (2,079 square feet) with an average construction date of 1973. The majority of residents in town are homeowners (66.3 percent) while 33.7 percent are renters. 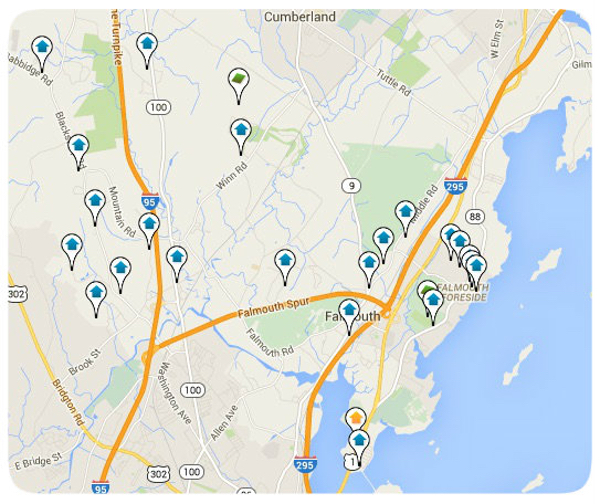 Condominiums are also available in Falmouth, although they comprise only 7.8 percent of residential dwellings. Single-family homes represent 89.7 percent of all residential dwellings in town. As an affluent community, homes in the area are naturally higher-priced than the general Metropolitan area. The median list price of a house in Falmouth is $449,000. The median sold price is $413,807. Finding a home in the area for sale is fairly easy at this time, but the market is competitive. Real estate values in Falmouth are fairly stable. One indicator of this would be the mortgage delinquency rate. The percentage of homeowners currently in foreclosure in Falmouth are only 5.7 percent, while the number of delinquent mortgages is only 2.7 percent. These numbers are significantly lower than the national average. Anyone looking for a stable, safe, upscale environment should consider purchasing a home in Falmouth.